Xobni Pro doesn’t go on sale often, so today is your lucky day! AppSumo, a site that offers great deals on web services, is selling Xobni Pro for 1 year for $25 dollars. For the price of 2 movie tickets (and popcorn, if you want to get exact), you can get all your contacts and email in order. After all, Spring has sprung, and Xobni can help Spring clean your inbox. Click here to learn more. 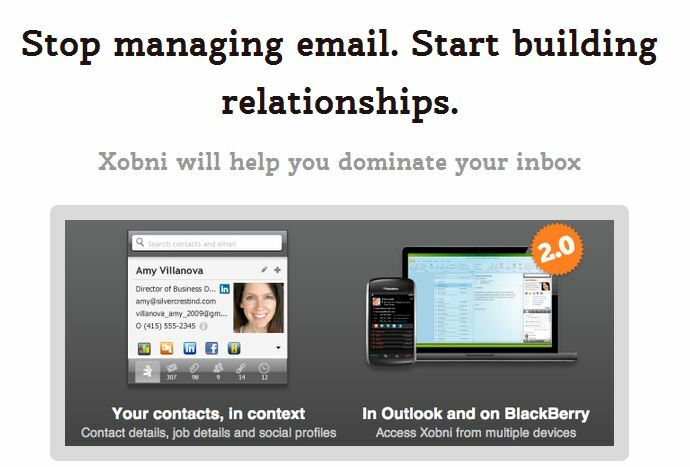 Xobni Pro automatically creates contacts for anyone you’ve ever email, called or SMS’d and makes them instantly searchable. Every person, phone number, email and file will be available to you in Outlook or on your BlackBerry. Whenever you need them! Time is running out – Don’t miss your chance. Buy Xobni Pro now on discount via AppSumo. Join Facebook, LinkedIn, Twitter, YouTube, Flickr and Yelp and give your company a prime spot in the inbox, where users spend 30%+ per day. We’re making it easy for developers to build an Open Social gadget that will run in Outlook and Google Apps. That’s right, build once, deploy twice. Space is limited. RSVP here – We’ll send the SDK to registered developers in advance of the event so you can maximize your time at the mini hack. More details coming soon to registered developers.